Lancashire Best Kept Village 2015 – will it be Aughton? As summer arrives in West Lancashire it’s that time of year again for the Lancashire Best Kept Village awards. Once again Aughton has entered and has high hopes of receiving an award. This competition has proved popular over the years and helps villages like Aughton maintain their own identity from the larger town of Ormskirk. More recently it seems that the categories have been slimmed down somewhat, which is a shame as it appears there is no longer a separate award for the best kept playing field. There was a time when the William Arnold Silcock Memorial Playing Field – home of the Town Green Tennis Club regularly picked up this award. This didn’t come as surprise to Club members as the playing field and its amenities are scrupulously maintained by the Council and the sports clubs who use the facility. It’s difficult to imagine a more pleasing environment for sporting activity. Judging started on the 6th of June and needless to say it would be helpful if the Village and the playing field was looking at its best over the next few weeks. NOTE The Town Green Tennis Club has played at the William Arnold Silcock Memorial Playing Field for over 30 years. It can be found on Winifred Lane, Aughton about 2 miles south of Ormskirk. It probably wont come as a surprise that the Junior Tennis Summer Camp which was due to start on Monday 27th has had to be delayed due to weather.and will now start on Wednesday (tomorrow). The forecast for Ormskirk and West Lancashire seems to be improving so hopefully the Juniors will have better weather for the three days of tennis fun. Please contact Bill Dow directly on 01695 624263 to enquire or to book. Junior Tennis Summer Camp – dates announced! Monday 17th August to Wednesday 19th August. Each day will run from 1pm to 4 pm and is open to all children 12 and under. Please note that these courses are open to non members and you do not have to be a member of the Town Green Tennis Club to participate. Please select a date(s) and contact Bill directly on 01695 624263 to enquire or to book. 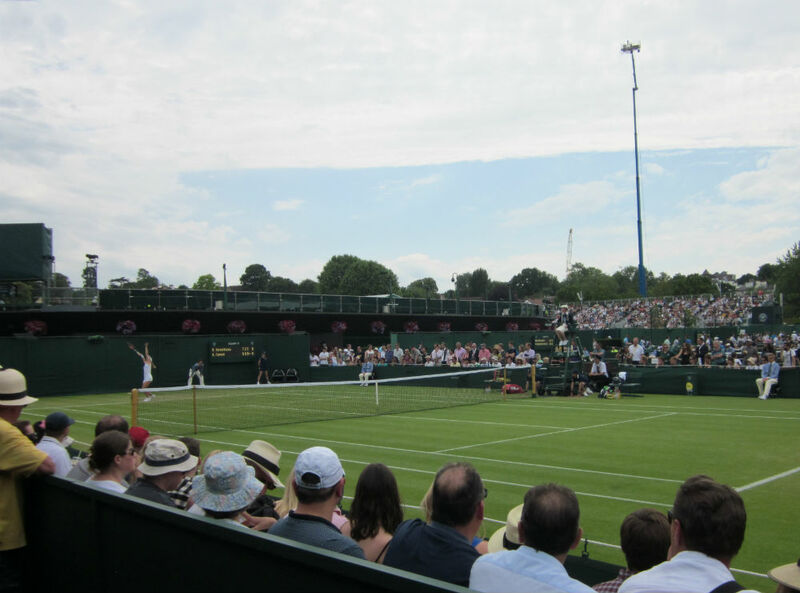 Members of Town Green Tennis Club have been staunch supporters of Wimbledon for many years, making the annual trip down to London SW19 on numerous occasions. One of our frist trips was in 1990, a quarter of a century ago. 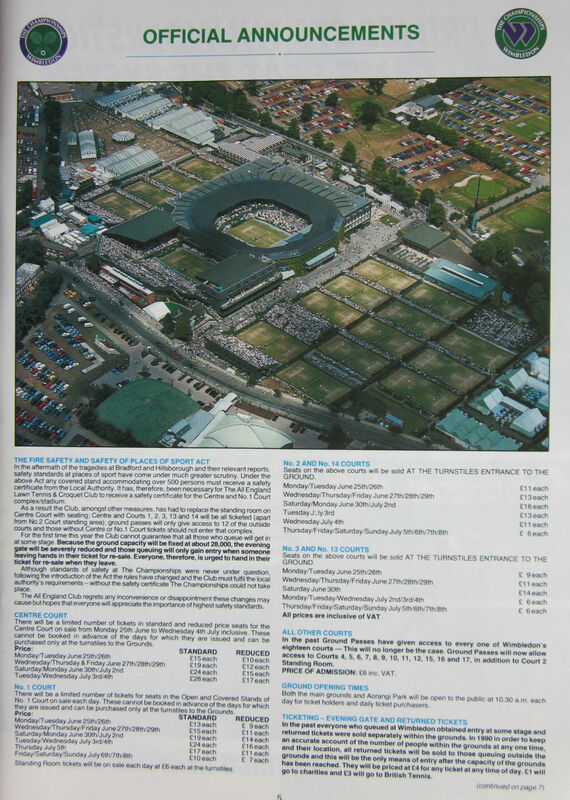 Wimbledon has had a lot of development over those years and this page out of the Programme that year brings home just how much has changed. Exterior view of Centre Court looking across Court 8. In addition to the obvious addition of the new number one court and the centre court roof, there have been many other subtle changes. 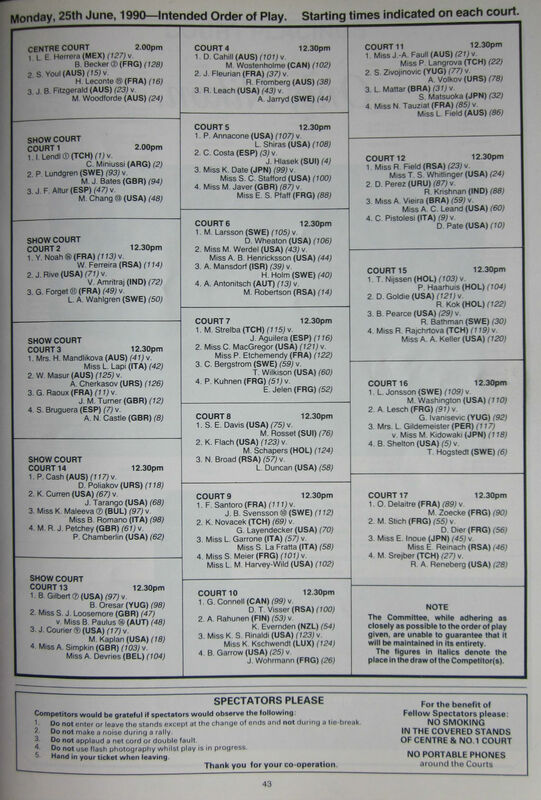 Many courts give an excellent close up view of the tennis as these pictures show but some will remember with affection the old quirky court six which was a bit out on a limb and very chilled. It was nearly always possible to get a court side seat or failing that, a spot on the grassed bank the other side of the court. This court was probably the most informal and relaxed of all the courts and offered a great location for spectators with a Ground Pass. 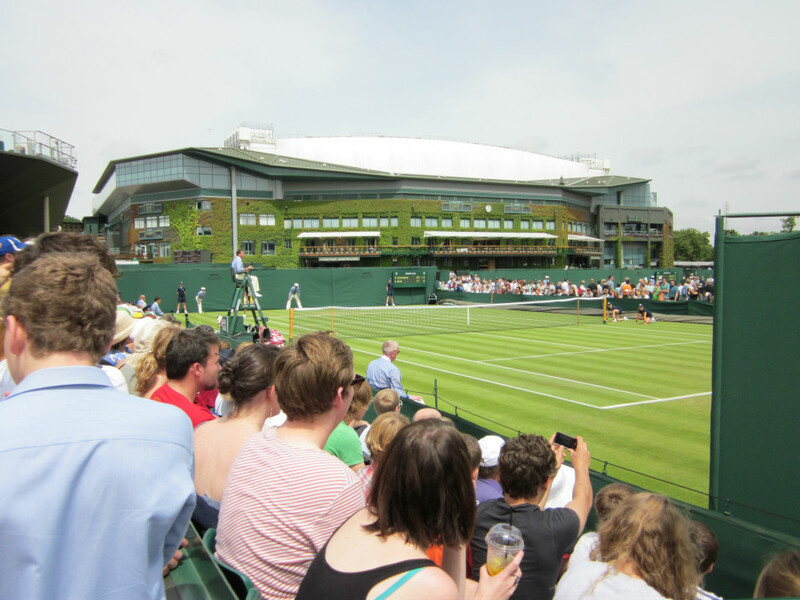 Court 11 – Wimbledon 2015. Still possible to get close to the action on the outside courts. We are a are small friendly volunteer club situated in Aughton about two miles south of Ormskirk in West Lancashire. This blog gives up to date information about news and events at Town Green for both members and anyone interested in playing tennis. It supplements our Club website with additional club information and the occasional tennis trivia – so please take a moment to browse and enjoy.